If you are pursuing a career in international media and are aspiring to reach the next level, DW can help you increase your potential. The International Media Studies Master’s program (IMS) from DW Akademie offers you the chance to combine cutting-edge interdisciplinary academic programs in modern media and journalism with practical experience at a world-class international broadcaster. The program is aimed at young people from developing and emerging countries with a year of professional experience and a bachelor’s degree in a media related field. The program is in German and English. With IMS you will be working with colleagues from all over the world while learning the skills to succeed in international media. You can find exactly what your application requires here. After you have gathered all of the materials and put together a well-written letter of motivation you can submit your application online. Take advantage of this excellent opportunity and send your application to DW Akademie by April 30. For their Ticket to Berlin game show, Deutsche Welle and the Goethe-Institut are conducting a worldwide search for nine people who are ready for adventure. For 10 days, contestants will travel all over Germany, fulfill certain tasks and meet interesting people. A camera team will accompany them on their journey and the videos of this adventure will be shown on the DW and Goethe-Institut websites. If you or someone you know has what it takes to compete, they should register on the show’s website. We need a photograph that shows you in full (not just your face), plus a short video. You can upload both here just as soon as you have registered. The closing date for applications is 28 June 2012! Find out more about DW’s German courses here. DW used the EXPOLINGUA in Berlin to present its new social networking platform for German learners. CommunityD – der Campus officially launched on October 28 and will provide those who want to learn German a great way to improve their skills – with interactive classrooms, chat rooms and multimedia material. The platform also allows students to become the teachers, by letting them upload their own audio and video content, vocabulary lists and other documents. EUROBOX made a successful debut in Romania at the beginning of October, after premiering nationwide on the public broadcaster TVR Info. 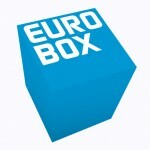 EUROBOX is a half-hour program made up of reports and features with unrestricted rights from DW. It covers current European and German issues, commentaries and a press review. It is adapted by DW’s partners in Romania and presented by a Romanian host. It will be broadcast on TVR Info on Saturdays with a second run on Sundays.